Kitchens and cafeterias are wonderfully social environments. Space for a quick meeting, a casual bite or just room to think. However, wherever food or drink is involved, it is more than likely there will be a fair share of rubbish. Sunset Quality Cleaning is dedicated to spotless offices so will have your kitchen or cafeterias back to their best in no time. Ready for another day of productive gatherings. We work with businesses of all sizes, in all industries, meaning we have experience of all types of kitchen and cafeteria arrangements. No matter how large your space, we are confident we will deliver a five-star service. We have built our stellar reputation on this very fact. 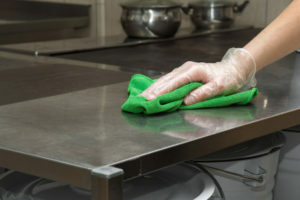 We can even offer guidance on your optimum cleaning schedule so that your kitchens and cafeterias have that ‘just-cleaned’ look no matter what the time of day. It is likely that the kitchen and cafeteria spaces will accumulate the highest volume of rubbish over the course of the day. As such, there needs to be a well-structured trash disposal plan in place. Our team will identify the best disposal points throughout your office so that we can avoid any unwanted build-ups as well as removing trash without having to pass through the working areas, as far as possible. 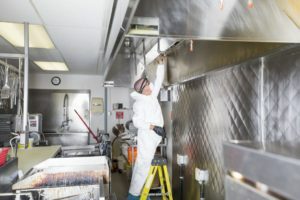 Hygienic food preparation spaces are integral to the ongoing health the workforce, and so we take incredible care when it comes to cleaning and sanitizing kitchens and cafeterias. From clearing and polishing sinks to cleaning down backsplashes, tops and cupboards, we return communal areas to their original, spotless state. Regular usage leads to an accumulation of detritus in sinks and drains. We clean and disinfect these areas on a frequent basis to avoid the risk of blockages, as well as reducing the chance of bacterial growth. This is a high-risk area if not managed appropriately, which is why we leverage our years of expertise to ensure all drains are kept impeccably clean. We appreciate how busy an office environment can be and, as such, how kitchen areas can quickly become less tidy than desired. Minor spillages and splashes are commonplace where coffee machines are involved, while food can go easily forgotten if left too long in the fridge. We make sure to wipe down these areas while cleaning out the refrigerator on a regular basis and removing items that are apparently past their best. It is vital to maintain the sanitation of filtered water units as these frequently-used facilities can quickly accumulate bacteria if not adequately maintained. From wiping down the cup dispenser to deep-cleaning the entire apparatus, a thorough approach is always advised and the only route we take in any task. Kitchens and cafeterias are prone to spillages – be it food, drink or other unwanted items – meaning great care and attention is required when cleaning. From vacuuming up debris to mopping the floors, our cleaning routine is guaranteed to deliver an exceptionally tidy result. Surfaces need swift attention to ensure no spillages result in long-lasting damage or marks, which is why we employ specialist products to take care of such incidents. Kitchens and cafeterias have unique requirements when it comes to ceilings and fans, as cooking or kettle boiling can lead to an accumulation of grease or condensation around such areas. Our team makes sure to wipe down lesser-recognized spots to avoid a build-up of grime, ensuring a hygienic environment that is safe for your team to use in their daily routines. If you’re looking for the most reliable, professional cleaning services in the Kitchener or Waterloo, Ontario areas, then look no further – Sunset Quality Cleaning has got you covered. Get in touch today. We’d be delighted to visit your business and work out a schedule to fit your needs!